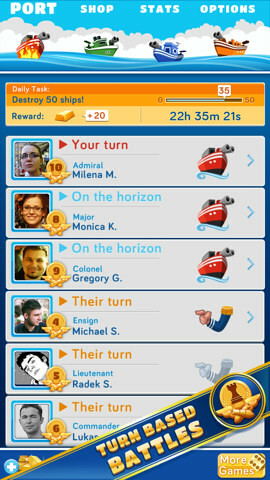 What do you get when you add Words With Friends style of gameplay with Battle Ship? You get BattleFriends At Sea! 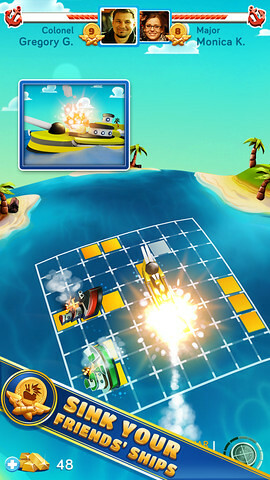 Challenge your friends to a sea battle! Play with Facebook pals or defy a random opponent and set the sea on fire in this stunning reimagining of a beloved classic! It’s easy to get started. Just connect with Facebook to find and play with friends! Invite your friends by Facebook or e-mail. Take a short break to fire just one shot or play many turns at once when you have more time. Start playing on iPhone at work, continue on iPad at home. One Response to "BattleShip Style ‘BattleFriends At Sea’ Now Out For iOS & Android [Video]"
Not available in the UK store sadly!